This skipper's caterpillars feed on a range of "ginger" plants and is a widely-distributed butterfly in Singapore. Its host plants include Cheilocostus speciosus (White Costus), Costus lucanusianus (African Spiral Flag), Hedychium coronarium (White Ginger Lily, Butterfly Ginger), Zingiber officinale (Ginger), Curcuma longa (Tumeric), of this the last two are used as spices in Asian food and also for their medicinal qualities. 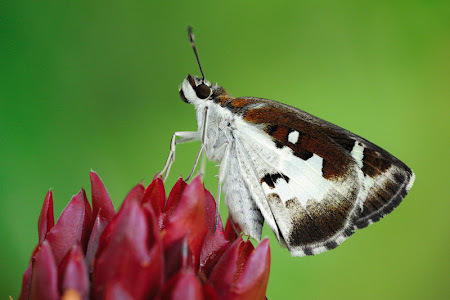 The Grass Demon is a predominantly dark brown with white markings on its fore- and hind wings and is unlikely to be mistaken for any other Hesperiidae species. This pristine individual was photographed by ButterflyCircle member Anthony Wong last weekend at a park connector. The Grass Demon is shown here, perched on the red buds of one of its caterpillar host plants, the White Costus.